I've been using Rivitalizing Day Cream for years and love it. It's the perfect light day cream that goes well under other foundation products like the tinted day cream. It's even good for slightly mature skin. It's light enough for night time as well - at least I've been using it that way for years, and I'm happy with it. Wonderful product that leaves my skin moist all day. 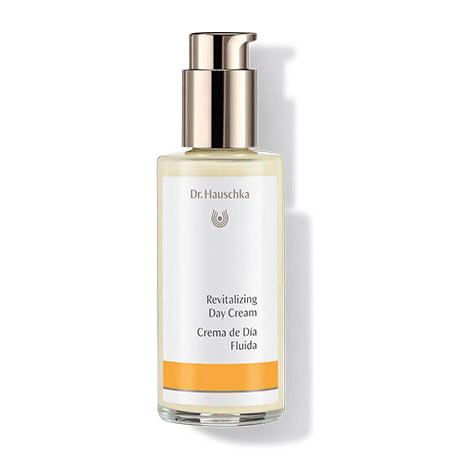 Would highly recommend Dr. Hauschka products from now on. Revitalizing Day Cream is so wonderful. It's like liquid gold. The Revitalizing Day cream is great. It is very light, but moisturizing. The smell is wonderful. This day cream surprised me that it was more liquid than cream, but it turns out I love it this way. It easily spreads and is absorbed into the skin. Leaves just enough of a moist feeling, not too "matte". The scent is wonderful, invigorating, clean and fresh. Use it just about everyday, either alone or with another layer of moisturizer. Very soothing and holds up good during the day! Love this facial cream, works great and has a wonderful fragrance. The best day lotion out there. Works so well for me. The smell is a bit overpowering (like a licorice smell) but you get used to it. Results are wonderful. I love this to hydrate my skin, not greasy, absorbs well, and makes my skin feel moist and refreshed. This moisturizer is very soft and silky, absorbing quickly and easily. I've been using this moisturizer for years, and I'm amazed at how well it nourishes, moisturizes and softens my skin. However, what I love the best is the delicious, flower-herbal scent...so soothing and luxurious! On occasion, I've needed to use other product and am always amazed and delighted at this moisturizer when I come back to it!!! I use it every morning after applying the clarifying toner. I love the way in keeps my skin moist and supple. In the winter months i switch to the Rose Cream. When I started using dr hauschka. My daughter recommended it and I love the way it feels and looks. It gives you a glow. I have a T-zone that is oily but also gets flaky and red (along with dry cheeks). It's combo skin at its worst. I used revitalizing day cream mixed with the clarifying oil and it has done wonders. I adjust the proportions depending on the weather/humidity. So relieved to find something that works after almost 30 years of misery! This is a great winter option. Unfortunately, it caused more breakouts despite feeling very light on application. I have transitioned to using it as a neck and décolleté cream, and it works wonderfully for this. The cream very much was pleasant to me, the structure liquid but at the same time not fat and well absorbed. My skin is very sensitive and dry. For the summer season, this cream is suitable. My dry skin is instantly transformed! Hydrates without being greasy. Doesn't irritate. This is my favorite cream. It's light, and doesn't irritate my dry skin. It smells great too. I HAVE BEEN USING THIS CREAM FOR ABOUT 5 YEARS NOW! EVERYONE ALWAYS COMMENTS ON HOW GREAT MY SKIN LOOKS! I HAVE TRIED MANY CREAMS OVER THE YEARS, BUT THIS IS THE ABSOLUTE BEST!!! I recently got this for my mom who has very dry, dry skin and she said it was the best product she has ever used in her ENTIRE life. Not even joking. Hauschka is the absolute best! So thankful for your products. One of my new faves! It doesn't flare up my facial skin and has pretty sparkles, not at all garish! Love it under my tinted day cream. I was expecting a heavier creamy texture but after using just one day, I was extremely impressed by how moisturized my face remained throughout the day. I smile often and always feel tightness from dry air, not with this product. I love it. I purchased three more bottles. I love this product. I love that it has natural ingredients too. The revitalizing day cream is a great boost for my face/neck area. The smell is faint and pleasant and the cream quickly absorbs into my skin. After use my skin looks healthy and feels fresh. This day cream is the best! Feels absolutely soothing to your skin the moment you smooth it on. I love these products! Thank you! I like using this cream on days I don't feel like having a thicker cream such as my usual Rose Day Cream, and even though this is very light and liquidy it does moisturize very well. Thin, dries on top of the skin; unimpressed. Not a cream. A thin, wet liquid. So unimpressed. Conversely, the regenerating Day cream sat on top of my face all day, never soaks in -all day - I had higher expectations from a higher end product. After an unusually dry winter my skin then went through a dry period. This was the best thing to have tried. My skin is now softer and smooth. It's expensive but well worth the money. I am so glad I found this! I have tried so many moisturizers and this one is the best. It really absorbs into the skin and gives me a beautiful glow. I will never use anything else!! 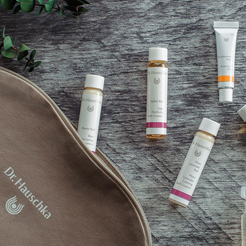 Have used Dr. Hauschka products for many years. Every time I try a different brand, I always come back. I am confident of the quality and it works for me. I use this in combination with the clarifying day oil in the winter. It solves my dry cheek issue beautifully! My skin has never felt better. So happy to have found this day cream! I live in Alaska and the winter can be harsh and brutal to skin. This product completely restores moisture and helps to maintain a summery dewy finish even in the winter. I also use it on my kids when they have a cold since it’s easy for the delicate skin around their noses to become chapped. It works wonders at keeping skin soft without becoming greasy. I love the Revitalizing Day Cream for an added boost of moisture under the Rose Day Cream during the cold Chicago winters. It absorbs immediately into the skin; providing an extra layer of hydration. I have been using it for years and it has helped my skin keep moist and considering my age (72) I don´t have that many wrinkles. I attribute this to the constant use of this wonderful product. A little goes a long way and keeps my skin balanced all day. Turns my blotchy skin to one balanced color. I do find that I need to let it soak in quite a bit before applying make-up and be sure to avoid eye area or make-up will smear. Have used it for years - please never change it! I use the product along with Melissa day cream on days and season when my skin is too dry. I really like the light but moisturizing texture of this cream. I think it has some light reflecting components because my skin seems to glow after application. It makes me look younger. I have noticed a positive change in my skin since starting to use the Revitalizing Day Cream. For maximum benefit, apply while skin is still moist from toner. For dry skin: Each morning after cleansing with Cleansing Cream and toning with Facial Toner, apply evenly to face, neck and décolleté with a gentle pressing motion. 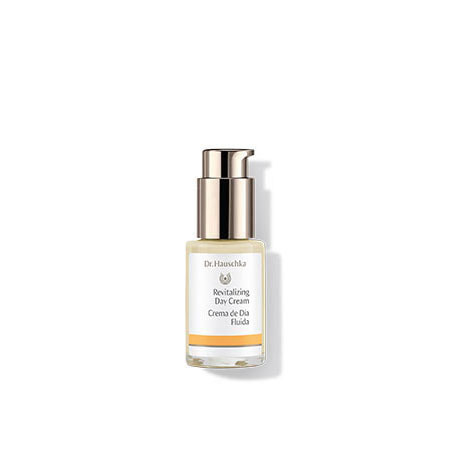 For blemished combination skin: After cleansing with Cleansing Cream and toning with Clarifying Toner, mix a small amount of Revitalizing Day Cream in the palm with 1-2 drops of Clarifying Day Oil, then apply evenly to face, neck and décolleté with a gentle pressing motion.